I had a request from a reader asking for some info on Peg Entwistle, aka "The Hollywood Sign Girl." It is unfortunate that her death is her only real contribution to Hollywood, considering she only appeared in one film. But, knowing her story, you can't help but thinking of her terrible sadness when you look up at the Hollywood sign....at least I can't. While researching, I came across a newspaper article from 1934 that talked about other tragedies that happened in Hollywood that I thought were interesting, if not morbid. It is my favorite holiday soon, Halloween, so...why not read some deliciously spooky stories with some hauntings on the side? 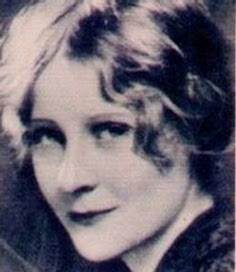 Peg Entwistle was born on Millicent Lilian Entwistle in Port, Talbot. She was born to Robert and Emily Entwistle and her upbringing has a few discrepancies that need to be ironed out. First, the story goes that Emily Entwistle supposedly died when Peg was still a child and that her father then gained full custody of her. But, it seems like the reality of the situation was that Emily and Robert divorced, and Robert took his daughter to America because he didn't want her to have anything to do with her mother. Not sure if this is just sour grapes or perhaps Emily was mentally unstable or sick in some other manner. Robert Entwistle re-married to a woman named Lauritta and had two sons by her, Milton and Robert Jr. Sadly, Lauritta died in 1921, and Robert died the following year after being struck by a limo, so Peg and her two brothers were sent to live with an uncle. It seems that Peg may have gotten the desire to act from her father, who appeared in a few plays while living in New York. One of her first stage roles was a tiny part in a production of "Hamlet" starring Ethel Barrymore. She was soon a part of the New York Theatre guild and sharing the stage with more big names like George M. Cohen, Dorothy Gish, and Laurette Taylor. Her longest running show, and the one that was the real highlight of her stage acting career was "Tommy." It ran for over 200 performances! She appeared in a string of other shows and in her last show, she was the understudy for Laurette Taylor. It was 1932, and it seemed like Peg's career was rising and rising fast! Later that year she made her one and only film appearance, in Thirteen Women which also featured Myrna Loy and Irene Dunne. It wasn't a success when it first premiered but time has been kind to the film because it has been cited and appreciated as one of the first "female ensemble" pictures. It paved the way for Bridesmaids by the sound of it. Because of the failure of her film debut, Peg's contract was not renewed and she didn't have enough money to get back to New York to work on the stage there. It seemed like her career, and her life, were over. All she wanted was to be a big star on the screen. On September 16, 1932, Peg left a note for her uncle saying she was going to visit friends and run some errands. Two days later, a hiker found a coat, pair of shoes, and a purse up near the Hollywoodland sign. When the hiker looked further, she saw her body. The hiker grabbed her things, dropped them off on the steps of the police station and then called 911. Way to take your time dude! For a few days after her body was found, Peg was an anonymous body in the morgue. Her uncle finally pieced together her strange disappearance and the news of the jumper and realized it was his niece. The note found in her purse cinched the case. A funeral was held for her in California where she was then cremated. Her ashes were interred in Oak Hill Cemetery in Glendale, Ohio next to her father. Her grave was unmarked for years until fans pooled donations together and bought her a brand new headstone (I believe in 2010). What a great thing to do for such a talented lady. Peg was married once, to actor Robert Keith in 1927. She divorced him two years later, claiming that he was cruel to her and that he never told her that he had been married before and had a six year old son. Interesting side note, the son in question, later became an actor...Brian Keith, best known for his roles in "Family Affair" and The Parent Trap. Here is one of those situations where you want to slap your head against your forehead. A few days after her death, a letter arrived at Peg's home offering her a role in a play...playing a woman who commits suicide. The role was a bit twisted considering the circumstances, but some people say that it would have made her a star. But, I don't know if this is just wishful thinking or what. Bette Davis was inspired to act by Peg. 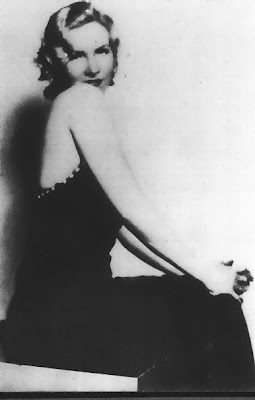 After seeing her perform in a production of "The Wild Duck," Bette told her mother, "I want to be exactly like Peg Entwistle!" Now go and say Peg wasn't important to film history!! It is rumored that if you go up around the sign at night, you can hear crying, and it is said to be Peg. Pretty sure that area is all off limits now because police didn't want any copy cat suicides. Does the name Sigrun Solvason ring any bells? No? Didn't think so. She was an Icelandic actress who was known for her striking resemblance to Greta Garbo and once even worked as Garbo's double. But, Sigrun wanted more than to just be another star's shadow, she wanted to BE the star! She too became too despondent over her non existing career that she too committed suicide. She dressed in her best silk pajamas, stood before a large mirror in her bedroom, and drank poison. She was found days later, collapsed on the ground, the walls surrounding her covered in pictures of herself...and of Garbo. She left a note simply saying, "I would like to be cremated and my ashes scattered without any ceremony at all." Marie Stanley worked as an extra on various films but could never break into bigger roles. Along with her desire to be famous was her desire to meet her idol, Jack Gilbert. She absolutely adored the actor, and when she found out he had married actress Ina Claire, it broke her heart. A few days after the news of the marriage broke, a friend found Marie lying unconscious on the floor and the room filled with gas. In Marie's hand was a picture of Jack Gilbert and nearby was a letter saying how much she loved him. She was only 19 years old. When questioned by police, Jack said he had no idea who Marie was. Not sure what happened to her after this incident, but I am hoping she was taken to a sanitarium of some sort. We have all heard the stories about women killing themselves after Valentino's death, but it is also said that these stories are just hype. Apparently, only a few woman ATTEMPTED to commit suicide, but none actually ever died. One of the women who did make an attempt was 20 year old Angeline Celestina who tried to shoot herself. She was later charged for having the gun in the first place. I did find an article about a 12 year old girl named Evelyn who supposedly died with a picture of Valentino clutched in her hands, but I can't access the full article. I love the story about the woman who said she was pregnant with Rudolph's child after his death. No one believed her because she was 8 months pregnant and Rudy's been dead for over 10 months. Lol. I'm very fond of Peg, I've liked her since I was a little girl. I am very interested in seeing the photo! Please e-mail it to me when you get a chance! pot the photo on here! No, I am hoping they post it or e-mail it to me though! Hi. Nice article. I hope you will give my book "Peg Entwistle and the Hollywood Sign Sucide: A Biography" a read!